First blog. First day of the new year 2010. A good day for firsts. Today the Holy Door of the Cathedral in Santiago de Compostela, Spain was reopened ritually marking the beginning of the 2010 Holy Year (An/~o Santo). Holy Years occur in a cyclical pattern of every 11, 6, 5, 6 years when the feast day of Santiago/St James the Greater, July 25th, falls on a Sunday. The last Holy Year was in 2004 and the next one will not occur until 2021. Pilgrims from all over the world will walk the Camino de Santiago pilgrimage this year and end their journey by passing through the Holy Door. The first time I walked through the Holy Door was in 1993 after I finished my first pilgrimage along the Camino de Santiago/Road of St James. Little did I know how much would transpire between walking through that door the first time and this latest passage 17 years later. In 1993 I entered with my pilgrim companions on a very hot July afternoon after waiting in line to enter for nearly an hour. The cathedral was packed and I felt overwhelmed with the emotion of the arrival. Today, I also, unexpectedly, found myself overwhelmed with emotion by the journey through that doorway. This time I was accompanied by my partner of 16 years and our three children. Gratitude was the prominent feeling. As we walked through the door and got on line to ‘dar un abrazo al santo’, ie, give a hug to the saint, all those years, and how much I have to be thankful for, came rushing through me. It was an ideal way to start this new year. On this blog I hope to tell part of this story – what led to that first initial crossing and what transpired in between. Little by little. Walking Your Blues Away. How to Heal the Mind and Create Emotional Well-Being by Thom Hartmann (Vermont: Park Street Press, 2006). I was gifted this book by a body worker who walked with us along the Camino de Santiago pilgrimage in 2005. After sitting on the shelf unread for at least a year, the right moment finally arrived to crack open the pages. It’s a quick read and easy to access. The most compelling parts are when Hartmann discusses how walking is a potentially healing activity for emotional trauma. This concept immediately began to resonate with my own anthropological work on the contemporary reanimation of the medieval pilgrimage route, the Camino de Santiago in Spain, which culminated in my book Pilgrim Stories. On and Off the Road to Santiago (UC Press, 1998). In the late 1980s people from many different backgrounds, countries, walking experience and belief systems (and frequently without a religious motivation) began to take up the traditional symbols of the Santiago pilgrim, the scallop shell and staff, and set out on demanding journeys walking westward across northern Spain (and even the far corners of Europe) to reach the tomb of the apostle James the Greater in Santiago de Compostela. Every year since then, more and more people undertake this walking journey and come home with positive stories of self-discovery, personal triumph, transformation and, even, change. The journey of the Camino can reveal wounds – loss, failure, fear, shame, addiction – left festering from daily life. Experiences along the way often act as the catalyst that allows them to be exposed. It has been, and appears to continue to be, a road for hopes and miracles of fulfillment of a different order. Some pilgrims, acknowledging this themselves, refer to the Camino as la ruta de la terapia, the therapy route (Frey, p. 45). Through the walking experience people opened themselves up, usually without any perceived intention on their part, to a whole series of unforced emotional experiences. Time and again, people recounted thinking of people that had not been in their conscious thoughts for years, developing a more active dream life as well as feeling ‘more deeply’ while on the road. In my book, I discuss this process of opening as part of the elimination of the distractions/stressors of daily life. When life is reduced to its basics and your mind is not absorbed with the minutiae of running a busy life, full of obligations and demands, all of sudden there is space for feelings, emotions, memories to come to the surface. While walking (though also many times during sleep and dreamtime), pilgrims described to me how they came to new insight, resolution or clarity regarding issues from the past. The walking became a healing process for both known and unknown or conscious/unconscious (prior to beginning the Camino) issues from the past. In Walking Your Blues Away, Hartmann has added a new dimension to my understanding of this healing process on the cognitive level with his discussion of ‘bilateral therapy’ – the alternating stimulation of the right and left lobes of the brain ‘while thinking of a problem or issue’ (p. 30). Stimulating both the thinking and feeling parts of the brain with the bi-lateral movement, the person is able to process the experience in such a way that it is moved from the forefront of memory to the past thereby reducing its negative hold on your psyche. Apparently most of our memories are processed during our REM sleep – another form of bi-lateral stimulation. Sometimes, though, the memories are too big/painful to be worked through in REM. Bi-lateral therapy works to simulate the same type of memory processing so that painful experiences can be worked through and moved into the past. Hartmann explains, “With the walking therapy…in most cases this recognition that the experience is in the past happens during the walk itself. That is the key indicator that the session has been successful” (p. 13). By applying bilateral theory to walking (an activity that requires the constant stimulation of the brain’s left and right hemispheres with its side-to-side motion), Hartmann offers an excellent way for people to heal themselves without having to resort to traditional ‘talk therapies’, or even any kind of verbalization of the trauma or painful memories. He posits that perhaps we have been healing ourselves, since the dawn of time before we had experts – psychotherapists, psychologists, shamans, etc. – by engaging in our most fundamental human activities: walking and thinking. His work is strongest when discussing the history of bilateral therapies and the application of them to walking based on his own experience and practice. Bilateral therapy has its origin in the development of healing techniques derived from hypnotism first recognized as therapeutic by Mesmer in the 1700s. He describes the fascinating story of Freud’s initial usage and success with bilateral therapy and hypnotism before he abandoned this path in favor of psychotherapy when hypnotism was discredited in Europe and America in the 1890s. His middle chapter on cultural bi-lateralism is over generalized and I found it to be an unnecessary distraction to the larger theme. 1 – “Define the issue”. Figure out what’s bothering you and picture it in your head. 2 –“ Bring up the story”. Flesh out the issue and determine its level of strength inside of you. 3 – “Walk with the issue”. It usually takes less than 30 minutes to get resolution. 4 – “Notice how the issue changes”. While walking observe how your feelings around the issue shift. 5 –“Anchor the new state”. Review the transformation of the feelings to fix it in your mind. “My impression is that a very large proportion have suddenly been confronted with a grave problem with home, work, family, career, their physical health or love life…and they are so overwhelmed by their everyday preoccupations that they don’t know what to do about it. Walking the Camino is a unique kind of therapy. I call it ‘Self-administered Ambulatory Psychotherapy’. 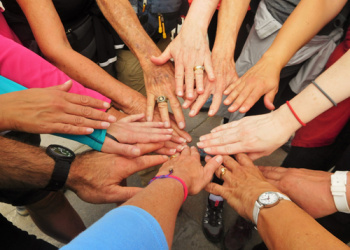 Troubled minds heal themselves – by walking the Camino de Santiago. (Spain, 7th edition, article: Camino de Santiago by Nancy Frey, p. 125, Lonely Planet, 2009). John has also observed the healing quality that is experienced by those who walk this historical pilgrimage path. Intuitively people have sensed that walking to Santiago will be good for them and have heeded that call to go, once again, the ‘human speed’. Hartmann’s book and technique will potentially be very helpful to people who walk (or those who don’t but who would like to) and who would like to more consciously make their walks productive for healing, creativity and focused thinking. While for many people the bi-lateral movement brings about the healing without realizing it, by having the technique available, it can potentially help people focus on problem solving as well as ‘anchor’ the new state so that the change is more lasting. In Pilgrim Stories, I write: “While it will not determine outcomes, making the pilgrimage can help the participant on a personal level to ‘rework the past’ and possibly ‘move toward a renewed future’ (Frey, p. 46). This sentiment is in essence the point of Walking Your Blues Away – it takes a very basic human activity and explores its great potential for healing and future well-being. Go take a walk! Thank you Erin Susan Parks for bringing this book to my attention. Erin is the owner of LMT Massage for Optimal Living in the Atlanta area.